In the mobile game Kingdom Hearts Union X, people can play a number of minigames related to Kingdom Hearts. This is important to Kingdom Hearts fans, as they can unlock the Starlight Keyblade in Kingdom Hearts 3 by playing. Before the release of Kingdom Hearts 3, a mobile game was released for IOS and Android called Kingdom Hearts Union X. As a side activity in the game, players can play a number of mini games. What makes this mobile game important for die hard fans is the ability to unlock the Starlight Keyblade after reaching a certain score in five mini-games. Here are the five mini-games you need to play and some tips in order to breeze through each game easily. You can check your high scores by selecting Extreme and then limited challenge from the main menu. 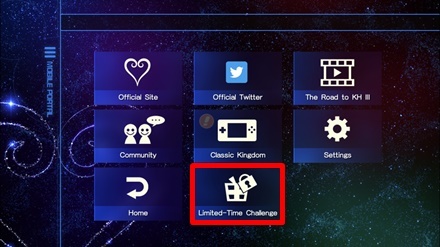 If you are in Classic Kingdom, touch the upper left arrow button and then limited challenge. You can either hold or press the UP and DOWN button continuously in this mini-game. Hold the UP button when reeling the line in and mash the DOWN button to maximize your speed. A higher speed will mean more successful catches. As the score increases, so does the difficulty. Try to be on the lookout for the big fish and signboards. 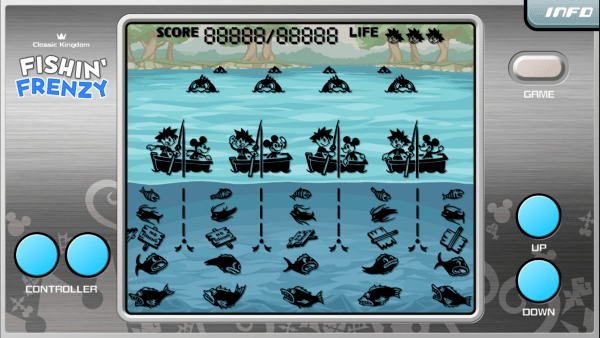 There will be more big fishes and signboards in the playing field as the game progresses. Hitting a signboard or getting eaten by the fish will reduce your life by one. Three lost lives and its game over. As the stage progresses, the movements of the giant will become faster and harder to avoid. Do take note that this game is not timed. As such, you can always rely on safe areas like the basket on the right side of the table and the tableware on the left side of the table. The musical farmer is all about gathering eggs in the three baskets and passing them to Mickey and Minnie. Each level has a target number of eggs you need to collect. With each level you advance, the target gets higher and the eggs fall faster. The difference between game A and B is the presence of the box in the middle. The box is present in A, making it easier as players don’t have to worry about switching the boxes. If you want to be safer, choose Game A. Up to six eggs can be placed inside a box. As such, it’s best to pass the eggs frequently when given the chance. Eggs mid-air can also be passed immediately once out of the pipe. Doing so will create more time to think about your next action. Also, an egg will not break if you move a pipe while it is inside. This mini-game’s goal is to deliver ordered food within the time limit. The difficulty will increase each time you fulfill an order. Each time the score increases, the time limit is extended. So it’s important to give food as fast as possible. To bake a sausage, press the action button while in front of the iron plate. Once the sausage is cooked, you can put it on the pan again by pressing the action button. Since Sausage is always included in the order, always try to cook and stock sausages. However, baking the sausage too much will cause it to burn, so adjust accordingly. Remember that you can prep the plate with ingredients, including ketchup, while waiting for the sausage to finish cooking. The Barnyard Battle is the last mini-game in the classic kingdom. In this game mode, you must knock out soldiers coming in from the back of the screen. Each wave gets faster and increasing numbers of enemies come down the lanes. The soldiers move at regular intervals. Each time they move, a sound effect occurs. It’s sometimes better to focus on the sounds instead of actually looking at every lane on the screen. Every 10 hits will increase your point bonus by 0.1. Since the soldiers move at the same time, practice can actually increase your chances of succeeding in this game mode. When two soldiers are marching at the same time, you want to press each button at the same. You get the Classic Notes keyblade for getting the highscores in minigames. You don’t get the Starlight keyblade from this, you get it by completing the Keyblade Graveyard. For beating them on KHUX you get a code for the Starlight. For getting any score in KHIII on the Gummi Phone you get Classic Notes Keyblade.